General Mills the maker of Lucky Charms, Trix and Cocoa Puffs plans to reduce the amount of sugar in its cereals marketed to children. The move, announced Wednesday, comes as many food companies alter their products and face growing scrutiny from consumers, regulators and health groups over the nutritional value of their foods. General Mills said it will cut the sugar in 10 of its cereals to single-digit grams of sugar per serving. It did not provide a timeline for reaching this goal, but it builds on reductions the company rolled out two years ago. The sugar in Cocoa Puffs, for example, could drop at least 25 percent from its original level and 18 percent from its current 11 grams per serving. "This is a significant development across some of our biggest and longest-term brands," said Jeff Harmening, president of the company's Big G cereal division. General Mills, which is based in Minneapolis, said the updated products will begin to roll out in the next year. The timing will vary by product. "The reduction ... doesn't represent perfection, but it represents improvement," said Kelly Brownell, director of the Rudd Center for Food Policy and Obesity at Yale University. 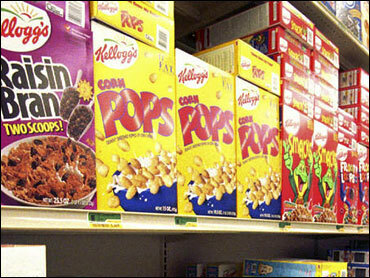 Several cereal makers have adjusted their products to address the growing concern. Last year, Kellogg Co. reformulated a number of its U.S. cereals including Froot Loops, Apple Jacks and Corn Pops. The changes vary according to product but decreased the sugar by 1 to 3 grams per serving. Kellogg also added fiber to some of its cereals. Post Foods said it has cut the sugar content in both Fruity Pebbles and Cocoa Pebbles by 20 percent. And it increased the vitamin D in Pebbles and Honeycomb cereals this year. "The cereal companies have really been under a lot of pressure," Brownell said. The Food and Drug Administration has been cracking down on food packaging that touts misleading health benefits. That led to one industry organization halt its "Smart Choices" labeling program, which was attacked because sugary cereals like Fruit Loops qualified for the label. General Mills' effort won't change some products like Franken Berry and Boo Berry, which are generally considered children's cereals and once had 15 grams of sugar each. General Mills has since reduced that to 12 grams, but the cereals aren't included in the new effort because they don't advertise on TV shows or other media aimed at children. And some of the company's other cereals, such as Cheerios, already meet the goal with 1 gram of sugar per serving. The Rudd Center recently published a study that found the least-healthy breakfast cereals are the most frequently and aggressively marketed directly to children. It also found that General Mills markets to children more than any other cereal company, and six of 10 least-healthy cereals in its study were made by the company. "Children deserve to be marketed products that are healthier to them than what is being marketed now," Brownell said. General Mills said the move is a reaction to consumers' desire for less sugar, rather than a response to criticism. The company said it has taken a number of steps, including increasing whole grain and nutrients in its cereals to improve their healthfulness. The company wouldn't say how the cereal's formulas would be adjusted except for the sugar reduction but said it would not use artificial sweeteners. Cereal makers argue that their products provide essential nutrients and are a healthy breakfast. But health experts are concerned that added sugar, which provides no nutritional value, could contribute to weight gain. The Rudd Center found children who ate highly sweetened cereals ate roughly twice as much as those who ate low-sugar cereals. And some say children are more susceptible to the marketing by food makers.